I’ve just finished stitching Le Jardin de Bobines by Nathalie Cichon of Jardin Privee, I bought the pattern at the Festival of Quilts last year, I loved the colours and it brings together two of my loves, gardening and sewing! I think it’s the fourth design of Nathalie’s I’ve stitched over the years. It’s been fairly quick to stitch, of course I did make a bit of a variation on the left hand plant. I managed to stitch a wiggle in where it was meant to be a gentle curve, I was stitching in the coffee room at work before my shift started so I was obviously concentrating more on the banter than I was on my pattern! I undid the worse line and make it at least look OK, even if it wasn’t correct! However it did mean that everything above that point is two stitches to the right. It’s the sort of pattern where that doesn’t really matter, though my butterfly is fluttering through a bit of a narrower gap than he would like, and the pink flower has a slightly smaller petal. It’s unique!! The finished design is about 6″ square, a bit too big for a small so I decided to make it into a cushion for my sewing room. I had a good rifle through my stash looking at various colours and combinations, nothing jumped out until I saw a batik which Helen gave me for Christmas, it seems to include most of the colours in the design and looks vaguely garden-like, it’s got the pinks and purples, turquoise and green. I had found my fabric! 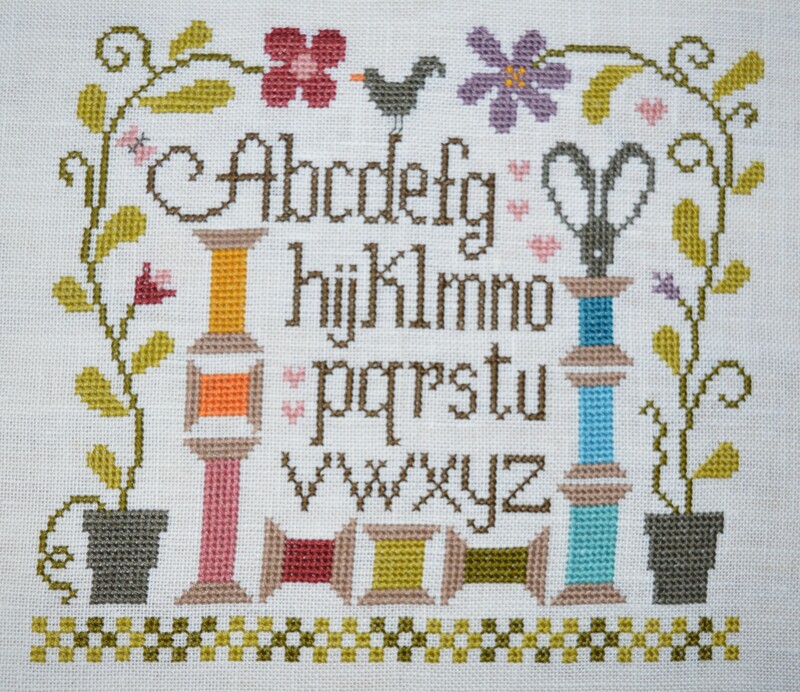 I stitched a 4″ border round the design, thinking I’d trim it to size. I thought I’d bought a 12″ cushion pad, but when I tried it I discovered it was actually 14″, so my 4″ border made it just the right size. I did have a play with some ric-rac round the cross-stitch, but it didn’t seem to add anything, so I went with a simple border. I backed it with the same fabric and just slip-stitched the pad inside. 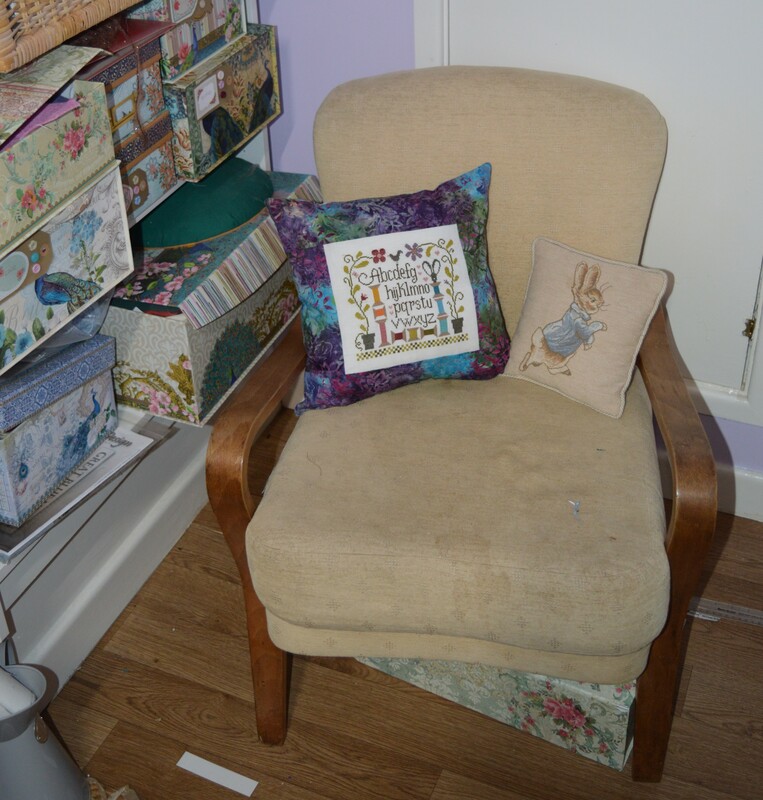 I have a little bentwood chair in my sewing room which I recovered a few years ago so my cushion looks perfect sat on there, next to my sewing shelves. I’m linking up with Kathy’s Quilts for Slow Stitching Sunday, please follow the link for lots of hand-stitching inspiration. 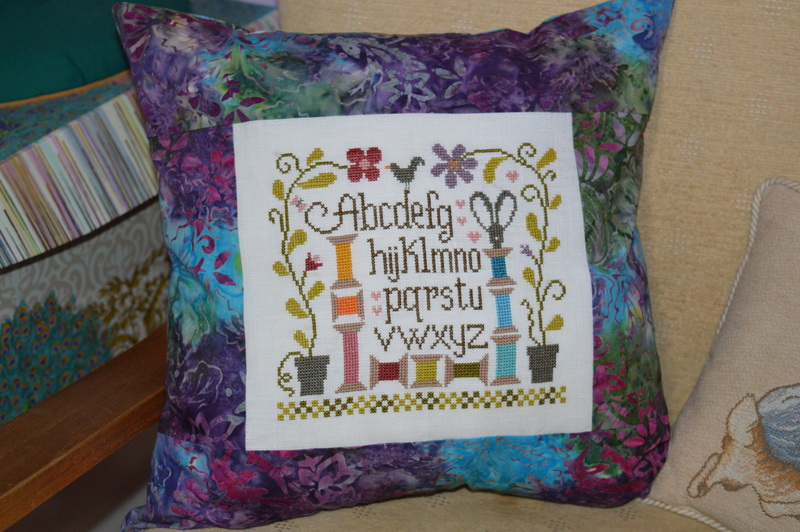 This entry was posted in embroidery, Sewing and tagged cross-stitch, Cushion, Garden of Bobbins, le jardin privee. Bookmark the permalink. Your cushion looks great, I really like the wide fabric border. That fabric is beautiful and perfect for the piece. Lovely fabric choice for a delightful pillow! Pretty! You’re right, the batik is an excellent choice for the border. Sweet and I doubt your butterfly minds zipping through the narrow space since it is so pretty. That border really highlights the cross stitch nicely. It looks great! I would never had known there was a mistake if you hadn’t said anything. I love how cute and spring like your stitchery is and the fabric you chose sets it off perfectly. It looks totally fabulous , a most glamourous cushion. But I am suffering from box envy- did you cover those boxes yourself, or manage to obtain them from somewhere. I do love a nice box. A woman after my own heart. T K Max here I come. It is absolutely beautiful! The fabric is perfect. I would never have considered batik and embroidery together, but your lovely cushion has made it work! Like Connie, I wouldn’t have picked up the slightly different bend in the stem unless you had mentioned it. What’s next I wonder? Looks great – loving the chair too! Thanks, the chair was left behind in the house when we bought it, I took it to an upholstery class to recover it. What a lovely cushion! And a great way to brighten up any space. that is a perfect finish! fabric really picks out the colours in the cross stitched piece beautifully! It’s a gorgeous finish! And nice on the cushion. I really like her patterns and she uses beautiful colours in her projects. I recognise some of those boxes too!